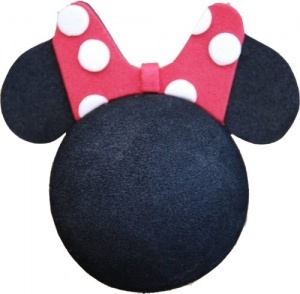 Our Minnie Mouse is one of our most popular designs. Push her onto your aerial making it easier to spot your car in the car park. 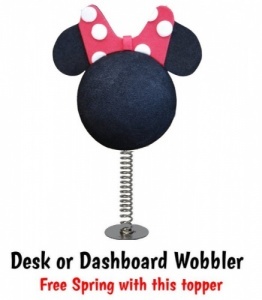 Or pop her onto a spring (supplied free) to turn her into a Dashboard Wobbler. Size: 7cm across x 6cm high. Made of: High density foam. Suitable for aerials up to 7mm thick. 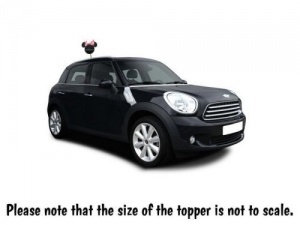 If you have one of the newer, thicker types of aerial then we can enlarge the hole so that it will still fit your car. Please send us a message along with your order. Ordered to replace my previous pink Minnie mouse topper with a silver crown. Was disappointed that this one was no longer available, and that your disney range has shrunk significantly since I ordered that one. But this topper is still perfect for me, and was dispatched super fast and arrived earlier than I expected too! Much cheaper than a trip to Disneyworld! Great service, at a price you can afford! Product arrived promptly and was exactly what I wanted to add some personality to my car very pleased! Great price and very fast delivery. Would definitely recommend this company. Fast service, dispatched immediately even though ordered on a Sunday. Free aerial ball included. Would recommend. so cute, looks wicked on my Mini, really good value for money. The product was exactly as described and supplied well within the advised delivery time.